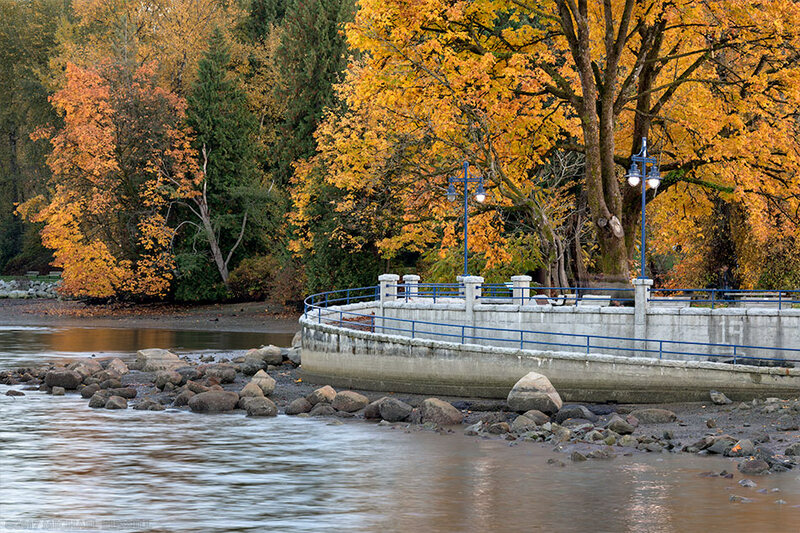 Sunset lights up a Bigleaf Maple Tree (Acer macrophyllum) on a fall day at Rocky Point Park in Port Moody, British Columbia, Canada. One of my many stops this year to photograph the fall colours was Rocky Point Park (map) in Port Moody. I was very happy that Vancouver and the Fraser Valley had a great year for fall foliage! I had not visited Rocky Point Park (other than looking at it from the Murray/Moody Street overpass) since approximately 2001 when I walked from the main parking area over to Ioco Road. That is a walk I need to do again, but last week I mainly visited the area around the pier and walked up the trail a short distance. The first photograph above shows the pier as well as a Bigleaf Maple that was brilliantly lit by the setting sun. 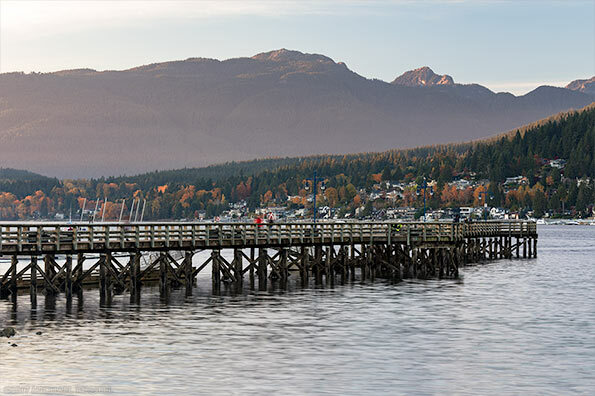 The second photograph here shows the pier in more detail, along with the houses and mountains in the background. It really is a nice view from Rocky Point. The main peaks in this photo are Mount Seymour and Mount Bishop. I walked to the end of the pier and there was a photographer there doing portraits. Twice last month I ran into photographers who were yelling encouraging (and over the top) words at their subjects. “OMG you are the most photogenic family I’ve ever seen!” etc. I don’t know if this is a normal thing for a portrait photographer to do publicly, but I know it decreases the enjoyment for others using the area. I’ve always thought those who think their photography is an excuse to unduly disturb others using a park are good candidates to ask about their photograph permit. The above photograph here is the view of Old Mill Site Park across Burrard Inlet from Rocky Point. I’ve been there before, but it looks interesting from afar so I should photograph it soon (and walk from Rocky Point). You can see what I presume is a platform for viewing Burrard Inlet, and the fall foliage surrounding it is probably just past it’s peak for the year. 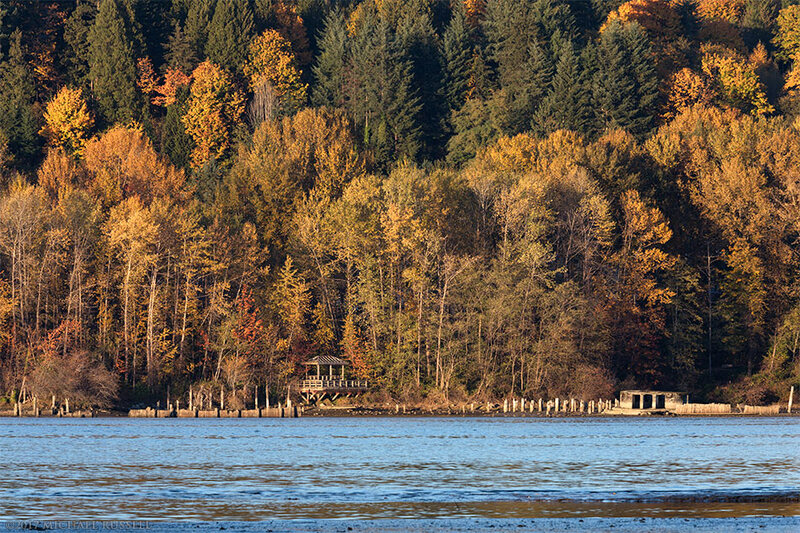 This last photograph is from the pier looking back at that same Bigleaf Maple from the first photograph. Our fall foliage can be spectacular (mostly due to a few Maple species) but it only reaches that level maybe once every 4-5 years. This year was very good, and this one maple tree is an example of why. The leaves have turned a bright yellow/orange, and very few of them have gone from green to a yellow/brown as occurs in poor fall foliage years. 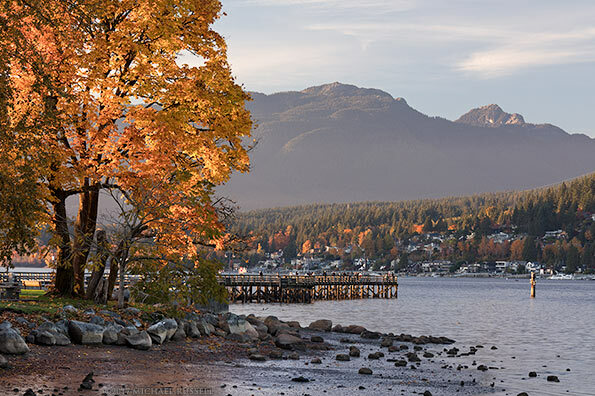 For more of my photographs from this and other nearby areas visit my Vancouver Coast & Mountains Gallery. 2018 Nature Calendar Now Available!